1. The Documentary Hypothesis and the Doublet of Pharoah's Dream -- The doublet of Pharaoh's dreams, and the inconsistencies (ok, mainly with midrashic sensitivities turned on) between the dream and Pharaoh's retelling. Why don't they say multiple authors here? And have the redactor be the one claiming that the two dreams are really one dream? Ok, I can give arguments why not, but there is a nice point to be made about deliberate use of the doublet for literary effect. 2. YUTorah on parashat Miketz. 1. Miketz: At the end of two years from when? And, did Yosef do right to ask the butler for help? I believe these two questions are related, and it is no accident that the midrash which has it as two years from his asking considers his request wrong. Plus, how to understand it as Yosef acting properly. Does Onkelos translate וַיִּקַּח as וּדְבַר or ונסב? The answer is that it is the former, despite R' Meir Wolf's variant nusach. Shadal and Lechem Abirim explain. YU Torah on parashat Mikeitz. Kedushat Levi: how the סריס Potifar could have been informed בשעת תשמיש -- Harmonizing two contradictory Rashi's, that Hashem transformed Potifar into asaris when he bought Yosef for משכב זכר purposes, and that Potifar's wife falsely accused Yosef when she was בשעת תשמיש with her husband. Miketz sources -- expanded. For instance, many more meforshei Rashi. Dreams caused by the four humours -- An example of how Abarbanel is a Torah UMaddah-nik, paying heed to the (unfortunately incorrect) science of his time. If not for it being incorrect, though, we might not know that he is doing this. The meaning of Tzofnas Paneach -- Can we know the meaning or, due to our sins, did we lose this Hebraic knowledge? If the latter, can this serve as an excuse to confidently advance the traditional explanation, "Revealer of Hidden Things?" In answer to a ponderous parasha point. Mikeitz Sources -- more than 100 meforshim on parashas Miketz and its haftorah, as well as links by aliyah and perek to an online Mikraos Gedolos. Why in the world did Yosef compel the Egyptians to circumcise themselves? Explaining Rashi's intent in the midrash -- that he regards it as a conversion of sorts. Ibn Caspi, and the overwhelming authority of nikkud, pt i -- I saw two interesting comments in Ibn Caspi on Mikeitz which reference how nikkud determines meaning, such that of course one cannot argue on nikkud. Because this was encoded by the Anshei Knesset HaGedolah based on the received tradition from Moshe Rabbenu. Compare with the approach of other meforshim, as discussed by Shadal in his Vikuach. Here, I analyze one of the two comments. I wonder at the particular applications he gives, for his nikkud appears different from ournikkud. Then, I turn to consider his parallel case in Kohelet, where he is certainly right as to the meaning of the nikkud, even as it truly seems that the meaning of the pasuk should be otherwise. Ibn Caspi and nikkud, pt ii -- In a previous post on Miketz, I discussed Ibn Caspi on nikkud, and how he felt that a particularkamatz on a word indicated the position of the Anshei Knesset HaGedolah. Though we do not have that particular kamatz, this is an important assertion, especially when combined with what we have in this post, that the Anshei Knesset HaGedolah got this meaning from Moshe. And combine that with what we saw in an earlier comment regarding trup, that since it reflects original intent, it makes no sense to argue with it. Here, we consider Ibn Caspi's comment about the kamatz in hanimtza, whether it is dispositive, and whether it really means to preclude the first person plural verb. My remarks at the recent bris, which pertain to Miketz, and the common of circumcision vs. the special meaning of bris milah. Junior on Miketz and Chanukkah -- regarding Miketz, that when the Torah relates that Yosef gathered up all the food, it couldn't have been literally all the food, for otherwise the Egyptians would have nothing to eat. Ibn Ezra makes the same point. In the course of Vikuach al Chochmat haKabbalah, Shadal claims that Ibn Ezra and Rashbam go against the trup in explaining a pasuk in parshat Miketz, about all the countries coming to Egypt, to Yosef, to buy grain. Perhaps another post is in order exploring just how this goes against the trup. Miketz sources -- all osrts of sources for studying this week's Torah portion. Including mikraos gedolos and many meforshim you might not otherwise have access to. Parsha points on Miketz -- all in one paragraph; the daled-resh switchoff; the matching text to biladay; and at length, parallels with the Haftara, of Shlomo Hamelech's dream. The Miketz - Daniel parallel -- first Daniel borrowing theme and language from Miketz, and then Chazal borrowing material from Daniel to supplement the midrashic narrative of Miketz. What Is Bothering Joshy? רְדוּ-שָׁמָּה -- How the "What is Bothering Rashi?" approach can go wrong. How focusing on the textual cues as what is quote unquote bothering Rashi can be misleading. And how a better question is "What is Motivating Rashi?" Indeed, in the particular devar I take apart, there are a few assertions, based on this approach, which turn out simply not to be so. The Goblet and the Terafim -- Thematic parallels between the story of Binyamin and the goblet, and Rachel and the terafim. And how Binyamin is perhaps involved in each case. Why Whole Years? Simply put, so that it will be Pharaoh's birthday once again. Put In A Prison, Taken From A Pit -- Even though Yosef is put into prison, he is taken from a bor, a pit. Just as at the start he is placed in a pit by his brothers. I suggest here that is deliberate. Each time he is removed from the pit, he is moved by a hidden Divine hand toward the position of royal vizier. We can collapse the middle section, and it is almost as if the events in Potifar's house didn't happen. This hidden Divine hand is made explicit in parshat Vayechi. Also, the role of dreams in advancing the narrative is a mark of the hidden Divine hand. This happens as well in Megillat Esther, as I write elsewhere. Bemidbar: Lift Up The Heads (2005) And the dual meaning. And Bemidbar has a third use of the term. Yosef the Democrat Does he take a fifth? Or does he organize? Vayigash: Are Reuven's Children Tribbles? (2004) How do Reuven's children double in number. A suggestion about the timing of the census. First, they removed him from the pit, equivalent to taking the woman out of the captives quarters and into the man's house. Then, he shaved. I would say not shaved exactly, but sheared. He cut his hair and became hygenic. Similarly, the beautiful captive gets to cut her hair which surely became unkempt during captivity. Finally, he changed from his prison clother. Similarly, the female captive gets to change into fresh garments, which, being a captive she probably did not get much opportunity to do. Rabbi Ally Ehrman: The Bracha Of "Chein"
Rabbi Joel Finkelstein: From Whence Confidence? Rabbi David Fohrman: Why Didn't Joseph Write Home? Rabbi Yehuda Goldschmidt: Take Advantage of Your Youth! Rabbi Aryeh Lebowitz: "Li Ein Milim, L'yehudi Dati Yeish"
Rabbi Michael Rosensweig: Why did Yoseif not just totally forgive? Rabbi Hershel Schachter: Why was Yosef punished for doing his hishtadlus? Rabbi Eliezer Zwickler: Call Your Father! Rabbi Shmuel Goldin: What Frightens a King? Rabbi Avraham Gordimer: Why the Grand Feast? Chanuka Candles on a Plane? An interesting thought occurred to me while reading over Ibn Caspi on Miketz, and, baruch shekivanti, I see that others have raised something similar before me. Pharoah's dreams are related twice -- once by the narrator and once in Pharaoh's retelling. (And a third time, within Yosef's interpretation.) This is thus a "doublet". And there are slight "inconsistencies" between the two, in terms of descriptions, and details in one and not in the other. Does the Documentary Hypothesis divide these into different documents? And if not, why not? Why do they make a big deal of some doublets and not others, and why some inconsistencies (which are, upon close examination, making a mountain out of a molehill) and not others? "And Pharaoh said to Yosef, in my dream...: I have already written in the sefer Tiras Kesef the reason of the repetition and the change in words which appear." The changes in the dream are minor, and might simply be natural variation, or else the true elaboration that emerges as one naturally tells over a dream. But a midrash picks up on these changes, and that Yosef changed them back in the interpretation, to proffer that Pharaoh deliberately changed the dream as a test, and Yosef passed the test by telling Pharaoh his true dreams. 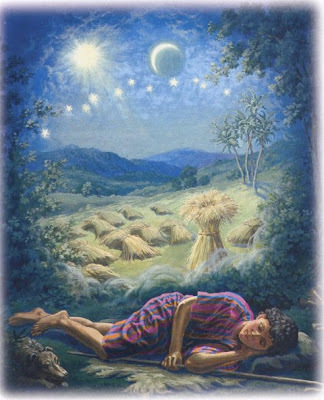 When Pharaoh repeated his dream to Joseph, he changed it a bit, either purposely to see if Joseph really knew, or unintentionally, as we often don't remember exact details. For example, Pharaoh started off on the shore of the river (taking a sun tan!) while the original dream said "On the river," stressing the Nile as the sustenance of Egypt. Pharaoh stressed the aesthetic aspect of the cows: "I never saw such poor cows in all of Egypt" (Genesis 41:19), instead of the fact that they were skinny and fat. ונתרומם, שנאמר: ויוסף הוא השליט על הארץ. אמר ליה פרעה: חלום חלמתי. אמר יוסף: בלעדי אלהים יענה וגו', תלה הגדולה בבעליה. אמר הקב"ה: אתה לא רצית להתגדל בעצמך, חייך, שעל ידי כך תעלה לגדולה ולמלוכה. אמר פרעה: חלום חלמתי, כשבא לומר לו את החלום בקש לבודקו, והיה מהפך לו את החלום. אמר ליה: והנה מן היאור עולות שבע פרות. אמר ליה יוסף: לא כך ראית, אלא יפות מראה ובריאות בשר. אמר ליה: הנה שבע פרות דלות ורעות. א"ל: לא כך ראית, אלא רעות מראה ודקות בשר. א"ל: הנה שבע שבלים מלאות וטובות. א"ל: לא כך ראית, אלא בריאות וטובות. א"ל: והנה שבע שבלים צנומות דקות. א"ל: לא כך ראית, אלא דקות שדופות קדים. א"ל: אחרי היית כשחלמתי, שנאמר: אחרי הודיע אלהים אותך את כל זאת, הוא שאביו מברכו: בן פורת יוסף (בראשית מט), אל תקרא בן פורת אלא בן הפרות יוסף. השיב פרעה: אתה תהיה על ביתי. Yet, all these are assigned to E.
Thus, the doublets he points out are the fact that Yosef has two dreams with the same message; Pharaoh has two dreams with the same message. (Similarly, I would point out, the butler and baker have similar dreams with slight contrasts which lead to opposite messages.) And these are assigned to the same author, J and E, respectively, and it is understood that parallelism from doublets are used by both authors as a technique. Blogs discussing it, not in the way anticipated: Hirhurim (The Sad Collapse), Rationalist Judaism (The Charedi Tragedy of Ignoring Chazal) and Emes VeEmunah. See also Cross-Currents. It was originally on Vimeo, but then that was password protected. It then was reposted on YouTube, it seems by the same party. Which seems to mean that it was not pulled because of backlash. However, beginning approximately 50 years ago, critics started objecting to this proposal. They argued that these doublets do not indicate separate sources. Indeed, the text reads better when a single source is assumed. Last year, I had a series of posts (one, two, three, four) discussing Yosef's sale. I think the switch-off of descriptive language (Medanites, Midianites, Ishmaelites) might well come from multiple sources, but these are each taking turns telling what is a complex, single story. And that the brothers pull up Yosef and sell him to the Ishmaelites, who are the Medanites and Midianites. And they do so on Yehuda's suggestion, while Reuven was away. Thus, they foiled Reuven's own plan for saving Yosef. 3) At the Seforim blog, Lawrence Kaplan's review of The Genius. 4) The Maccabeats with a new song for Chanukkah. 5) It has been a while since I've done one of these roundups. Here is the most recent one from Life in Israel and the most recent one from Yeranen Yaakov. Rabbi Reuven Brand: Why Jews and not Joes? Rabbi David Forhman: Who Really Sold Yosef? Rabbi Yehuda Goldschmidt: Bowing Down to Who? Rabbi David Hirsch: Why is the Leadership from Yehuda? Rabbi Aryeh Leibowitz: Dreams and Dreamers: How Seriously Do We Take Them? Mrs Ilana Saks: Who Mourns for Yosef? Rabbi Hershel Schachter: Why was Joseph punished for asking the sar hamashkeh for assistance? Dr. Shira Weiss: Who sold Yosef and did they have free will? Rabbi Netanel Wiederblank: Providence in the story of Yosef—Were the brothers responsible for Yosef’s sale? Rabbi Andi Yudin: Bringing the Geulah! Rabbi Ephraim Meth: Is Antinomianism Really Against the Law? 1. Saving Yosef by casting him into a pit with scorpions? From Chiddushei HaGriz, a solution as to Reuven's intentions and thought-process. 2. YUTorah on parashat Vayeshev. 3. Who sold Yosef? In parshat Vayigash, there is fairly straightforward evidence that the brothers sold Yosef. Not the Midianites. Namely, we see in Vayigash that Yosef explicitly says that his brothers sold him. And a simple peshat reading of the pesukim in question in Vayeshev would be that Yehuda suggested that they sell him to the coming Ishmaelites, and then, when the Ishmaelites, who were the same as the Midianite traders arrived, the brothers carried out their plan. Now the midrash / documentary hypothesis / Rashbam as pashtan / 'close reading' which is really neo-midrash but bills itself as peshat -- declares that the brothers did not sell, but rather that Midianites came, pulled Yosef out of the pit, and sold him to the Ishmaelites, all without the brother's knowledge. I do not believe this to be a correct peshat in the pesukim in question. 4. And then, as a followup, where did Reuven go? Since in the prior post I was focused in that post only on the pesukim directly related to Yosef's sale, I did not address other issues indirectly related to whether the brothers sold Yosef. For example, Reuven disappears. Where did he go, and what does it mean that he returned? 5. As a further followup, How plausible is a Midianite / Ishmaelite switchoff? Pretty plausible. For instance, see Shofetim perek 8 pasuk 22 and 24, where Ishmaelites are exchanged for Midianites without second thought. But then, addressing many different facets of this question. Thus: Q: Why would the Torah refer to these traders sometimes as Midianites and sometimes as Ishmaelites? We should expect the Torah to choose a single term and stick with it! Q: OK, the Torah will sometimes switch off language. But here, it is extremely confusing! Why would the Torah deliberately confuse us so? We only know that Midianites can be referred to as Ishmaelites from one small segment in sefer Shofetim. Q: Ishmaelite is most often used in Tanach to mean Ishmaelite, and Midianite is most often used to mean Midianite. To seize upon the one rare usage and assert that this is what it means represents an incredible kvetch. Q: Is it too early to say Ishmaelite for Midianite? Q: What purpose does the switch-off between Midianite and Ishmaelite serve? If it serves no purpose, then the switch-off does not make any sense! Q: What about the Medanites who appear later? And I think I give pretty good answers to these. 6. As the final post in this series, Medanites, Midianites, and Ishmaelites. And how one defines peshat. Quickly, in Yosef's sale, Midianites == Medanites == Ishmaelites. Therefore, the brothers sold Yosef to the Midianites. There is good evidence for this. Within the story, a number of pesukim make it clear this is so. Outside the story, pesukim in Shofetim show that Midianites == Ishmaelites is possible. And while there are "difficulties" in that one needs to equate different words, I do not deem these to be peshat difficulties. And the alternative peshat interpretations have a number of more severe difficulties, which are true difficulties. It all comes down to how one defines peshat. I can put my definition in the most starkest terms: Do not make a big deal of minor differences. Abarbanel on Yehuda and Tamar's "yibbum" -- As described in the above post, Don Yitzchak Abravanel asks some incisive questions about the nature of the apparent yibbum by Yehuda and Tamar. Here, he resolves those questions. It was certainly not a complete yibbum, for yibbum is for brothers, not fathers. (And he explains why.) Tamar took the steps necessary, but it was certainly not Yehuda's intent. And this particular joining does not form the pattern for subsequent yibbum. Yehuda and Tamar, and Boaz and Rus, as performing real yibbum -- My own thoughts about the points raised by Abarbanel. Could we find a way for the actions of Yehuda and Tamar, and of Boaz and Ruth, to be actual yibbum, rather than just 'customary' yibbum, or no yibbum at all? Vayeshev sources -- further improved. YU Torah on parashat Vayeshev. Why did Yaakov only await fulfillment of the *second* dream? Perhaps because only celestial bodies bowing goes out of the natural order; or maybe, the purpose is to stress that Yaakov's criticism of the second dream was a sham, to try to keep peace among the brothers. Ibn Caspi on the Zakef on כְּתֹנֶת בְּנִי -- How it is appropriate placement by the baalei hamesorah. I agree, and it is obvious. Yet, the comment is worth noting. Shadal on the trup on הִנֵּה בַּעַל הַחֲלֹמוֹת -- Shadal corrects the erroneous trup; and Wickes makes the same suggestion, finding two texts which have it. After all, should בַּעַל really be separated from הַחֲלֹמוֹת הַלָּזֶה? Then, Shadal differs with a different aspect of trup. And he also gives his thoughts on the etymology and meaning of הַלָּזֶה. Ibn Caspi and the trup on מַה פָּרַצְתָּ עָלֶיךָ פָּרֶץ -- The words מַה פָּרַצְתָּ עָלֶיךָ פָּרֶץ can mean "With what strength you have strengthened yourself!" Alternatively, as Ibn Ezra suggests, it can mean two statements of מַה פָּרַצְתָּ (how have you breached) and עָלֶיךָ פָּרֶץ (the guilt of the breach is upon you). Ibn Caspi and others find support for Ibn Ezea's parse in the tipcha on מַה פָּרַצְתָּ. What is the role of shalshelet? Should we darshen the psik of it? What about the shalsheles leads to these various interpretations? Rav Levi Yitzchak of Berditchev on the role of the shalsheles on וימאן -- In a recent post on Vayeshev, I cited Birkas Avraham, who gave several reasons for a shalsheles. I added some ideas, from others. But while he mentioned the Kedushas Levi, Rav Levi Yitzchak of Berditchev, he only listed the first of the reasons the Kedushas Levi gave. In fact, there are quite a number of other reasons offered there. Here, without added commentary, I present the various reasons offered. Tamar's judgement as Torah Law, Noachide Law, Contemporary Law -- Which one is it, and when? Ibn Caspi says that the death penalty was Noachide law while freeing her from the same was contemporary law. Was Sarah buried in the Valley of Chevron? A variant text in the beginning of parashat Chayei Sarah, present in the Septuagint and Samaritan Pentateuch. And why I believe the masoretic text to be better. This relates strongly to parashat Vayeishev as well. Vayeshev sources -- expanded. For example, a lot more meforshei Rashi. Is Vayikirah malei or chaser? An instance in which our Masoretic text is malei while the Samaritan text ischaser. This goes against the grain. Should we therefore lend credence to the Samaritan text? Why would the shivtei Kah try to kill their brother? After all, isn't this a violation of lo tirtzach? And didn't the avos and, by extension, the shevatim, keep all 613 mitzvos? How did Reuven save Yosef by casting him into a pit filled with Snakes and Scorpions? If there was no water, but instead snakes and scorpions, then how was Reuven saving him by casting him into the pit? Why Didn't The Brothers Try To Stone Yosef To Death? So asks Hillel, in a comment on my previous post. In that previous post, I suggested that they had determined that Yosef was a choleim chalomot, and thus a navi, sheker. And so they wished to put him to death as a false prophet. In this post, I explain how their actions were more precisely in line with the halacha of executing a navi sheker. According to Sporno, why does Yehudah reference 'monetary profit'? After all, the point is judgement, not revenge! The answer is that Yehudah doesn't really, literally. But this just goes to show how derash, introduced by Rashi, gets totally ingrained as peshat in our minds. Vayeshev sources -- links to an online Mikraos Gedolos, plus more than 100 meforshim on the parsha and haftorah. Thus, updated from last year. Is tzadeka mimeni one statement or two? Pashtanim arguing on midrash. Once again, midrashim vs. many pashtanim about how to explain a specific pasuk. In this instance, it is something that seems midrashic in the first place, whether tzadeka mimeni is one statement, or two separate statements. Onkelos, Targum Pseudo-Yontan, the gemara, Bereishit Rabba, and Rashi all treat it as two separate statements, either both by Yehuda, or the latter by Hashem. But many of the other meforshim explain it otherwise, as a single statement, that she is more righteous than I. And more interesting that pashtanim arguing on midrash is Ibn Caspi's point, that the derash is at odds with the trup, and that since trup is from Anshei Knesset HaGedolah and reflects Hashem's intent, we cannot argue on it..
And further thoughts on tzadeka mimeni -- As discussed in a previous post, saying that tzadeka mimeni are two separate statements ("she is righteous; the pregnancy is from me"; or else "the situation is from Me") is at odds with the trup, which has no pause between them. Yet Rashi endorses this as bothpeshat and midrash. And it appears that so does Ibn Ezra. Here, I give further thought to what could influence this explanation -- the word yakir and the otherwise absence of an admission by Yehuda. The Aramaic translation of the bad word -- Shadal on the correct girsa in Onkelos; I think perhaps a good example of lectio difficilior. The proper Aramaic translation of dibatam -- is it dibbehon or tibbehon. But nothing exceptionally innovative here. Moral lessons from parashat Vayeishev -- Some straightforward lessons about interpersonal relationships, from Ralbag. Some of which are fairly obvious when you just stop and consider the story carefully. Some of it, of course, it a matter of how one parses the Biblical narrative and associated midrashim. Vayeshev sources -- online, by aliyah and perek in Mikraos Gedolos, and by meforshim, at JNUL. And in the comment section, a discussion of Zuleika, wife of Potifar, which will soon be its own post. Two noteworthy comments about the nature of peshat, and the one of Vayeshev is the famous comment of the Rashbam. Parallels between the incident of Tamar and Amnon, and parshat Vayeshev. I note a few of them, and there is a more developed discussion in the comment section. What in the world is kesonnes passim? And how only Yosef and Tamar were tznius. Or not tznius. And then it develops from there. What does it mean that it reached pas yadav? What sort of Petil did Yehuda give Tamar as surety? And how, after Ramban rejects the idea it was tzitzis, as sacrilegious, Baal HaTurim suggests it was his tefillin. And much more. Zuleika, the wife of Potiphar, in the Koran and in Sefer HaYashar. And how I think that this particular midrash might be no more than a borrowing from the Koran. Who was in the pit? A 4-year old take on parshat Vayeshev. The appropriately named Er and Onan, and Hevel, and Machlon and Kilyan. What a choice for names! Bar Kochva as the gilgul of Shela -- from Rav Chaim Vital. Which Daughters comforted Yaakov? Did he have more than one? What did the wife of Potifar ask Yosef to do? And the danger of euphemisms in obscuring the actual intent. Why Mention that Yosef Got Lost? Dramatic tension, no witnesses, plausibility of the story that he was attacked by wild animals. and expressing willingness to perform kisui hadam. humor. and as it relates to the sale of Yosef. whether Islamic style headscarves are what ancient harlots wore. As repentance. I analyze various aspects and textual cues of this midrash, and how Rashi reinterprets or correctly understands the midrash. Was Yehuda's marriage subsequent to, or co-occurring with the general timespan of Yosef's sale. This is predicated on the meaning of baEt hahi. Yaakov/Yosef Parallels While in a previous post I mentioned parallels between Yosef and Esav, a midrash highlights many parallels between the lives of Yaakov and Yosef. Shortsighted Foresight People who see the future via prophecy or astrology, but misapprehend what they see. Mistaken Identities -- How many times does the theme of mistaken identity come up in Tanach? Choice Garments and Goat Bits -- Parallels between two sibling rivalries. In Chutzpah! I note that the brothers are shepherding in Shechem, which they had destroyed in the previous parsha. Although Yaakov initially feared a reaction from the neighboring towns, the pasuk (Bereishit 35:5:) tells us that the fear of God was put into the inhabitants of the towns and the hostile reaction did not surface. Here they are, initially shepherding in Shechem, perhaps even the flocks taken as spoils from Shechem, and Yosef has no fear to go to Shechem alone to see how things fare. Also, Tg Yonatan has two points about the sale of Yosef: it being preordained, and being linked to the destruction of Shechem. In Dibatam Ra'ah I discuss the word נַעַר as a verb in the second pasuk of Vayeishev, in Bereishit 37:2. The midrash gives three bad things the brothers did, or appeared to do, that Yosef reported - eating 'ever min hachai, treating the sons of Bilhah and Zilpah as servants, and secual improprieties. I show how these might be derived from the pasuk. Finally, Tg Yonatan gives on sin - that he saw them eat the ears and tails separated from the live animals. I give Perush Yonatan's explanation for this, as well as a possible derivation from the text. In Where Does the First Pasuk Belong? I note the relationship between the first pasuk which says that Yaakov settled in the land of his forefathers, with a similar statement about Esav in the previous parsha. I suggest it logically belongs to the previous parsha. This may relate to the order of the narrative, such that the story of Yosef actually precedes the birth of Binyamin and thus Rachel's death. Some proofs that Binyamin is not yet born - Binyamin is not mentioned; Yosef is called the ben zekunim - son of old age; and Yaakov asks "will I and your mother bow down before you?" implying that Rachel, Yosef's mother, is still alive. In Brand Name Recognition? Or Lack Thereof? מהר"א אשכנזי, based on Islamic practice, explains Yehuda's command that Tamar be burnt is a command to brand her forhead to label her a harlot. The presence of the mark is the reason harlots would typically cover their faces, and the pasuk says that Tamar did this when pretending to be one. In A Baaaad Report I suggest that on a peshat level, rather than דִּבָּתָם רָעָה meaning an evil report, it actually means a report as to how the shepherding is going. Proofs to this effect - nowhere do we see explicitly what the bad things he reported were, nor that the brothers hated him for it. Further, it seems to set up the story such that we understand why Yaakov sends Yosef after his brothers to find out how the shepherding is going - this is his role.